Older homes often hide what we like to call hidden treasures. Many times, beneath carpets or the hardwood flooring below your carpets need only be refinished to transform your home and added thousands of dollars in value. Even your existing floors may be in need of refinishing to remove worn-in dirt, light surface scratches and small indentations. You can also refinish floors to update the style of your home, changing the color scheme from light natural and honey tones to dark browns. Refinishing hardwood floors can make an older floor can make it look brand new for just a fraction of the cost of installing a new one! 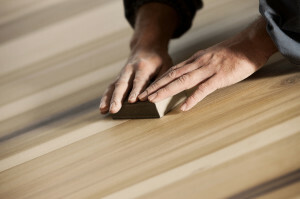 Refinishing hardwood floors actually requires less household disruptions than you would expect. F&L Floorworks are experts in minimizing your inconvenience while refinishing. While the floors will be unavailable to any foot traffic and furniture in the area must be removed during refinishing, we plan our work to allow light traffic eight hours after each phase. I love my house now. Dave and his crew were amazingly skilled and I was treated like royalty. Thank you, Dave.